Pro-democracy activists Joshua Wong and Nathan Law have urged their supporters to press on with social movements ahead of their potential imprisonment on Thursday. 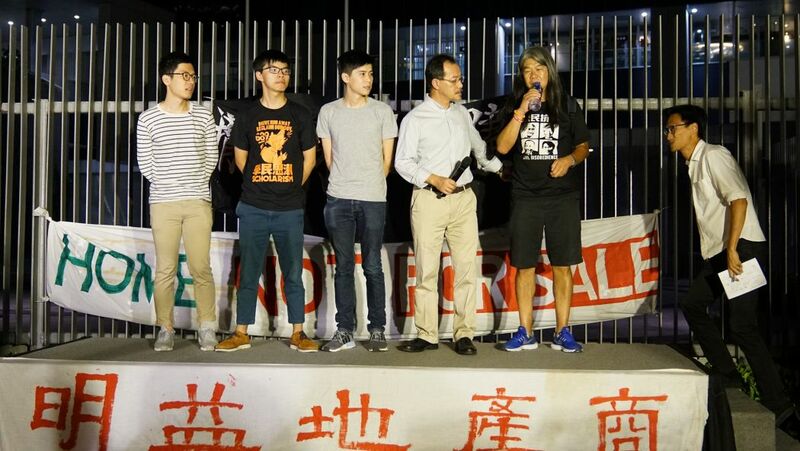 Hundreds attended a rally on Wednesday night in support of 13 environmental activists who were jailed for between eight and 13 months after a review of their sentences was lodged by the Department of Justice. They had previously completed community service orders for their unlawful assembly convictions. On Thursday, Wong, Law and activist Alex Chow will face a similar review lodged by the government at the Court of Appeal over their their own unlawful assembly convictions relating to the 2014 Umbrella Movement protests. Law and Wong have also completed their community service orders and say they expect to be imprisoned. 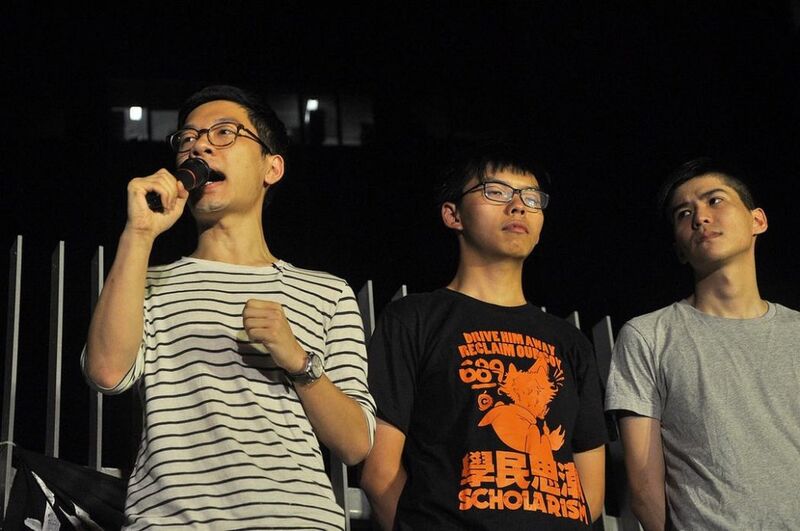 At the rally, Wong was sporting a Scholarism t-shirt, the now-defunct student group he co-founded. 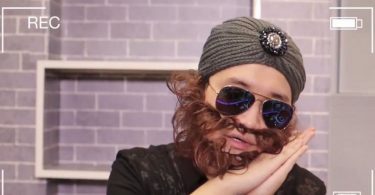 He was the convener of the group when he participated in the 2014 Occupy protests. 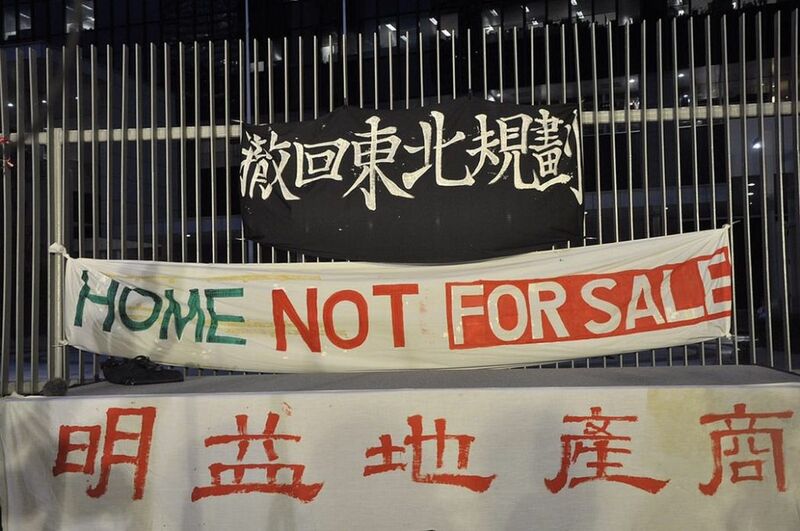 On September 26, 2014, the trio stormed Civic Square, a closed forecourt outside government headquarters which has a symbolic history for protesters. 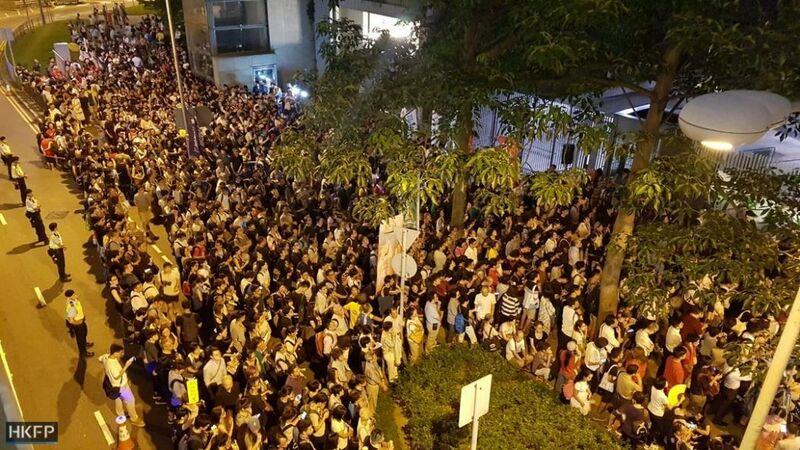 The incident came after class boycotts were held against a decision made by the Standing Committee of the National People’s Congress, which stated that Hong Kong’s chief executive candidates must be vetted before a popular election. The police later used tear gas to disperse thousands of demonstrators, and a 79-day protest occupying main roads around Hong Kong ensued. Wong said he may be imprisoned for the first time on Thursday, but he felt honoured. Nathan Law, Joshua Wong and Lester Shum. Photo: In-Media. Wong said they may be given a jail sentence of more than a year. “I hope when we come out in 2018, we see a Hong Kong with hope, a Hong Kong that we are unwilling to give up,” he said. Ex-lawmaker Nathan Law, who also participated in the action in 2014, may also be imprisoned. Just last month, he was disqualified from the legislature by a court after a legal challenge by the government. He also urged Hong Kong people to continue protesting even if dozens of “political prisoners” are jailed. 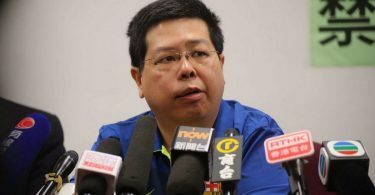 Raphael Wong, vice-chairman of the League of Social Democrats, was one of the most high-profile activists jailed on Tuesday. 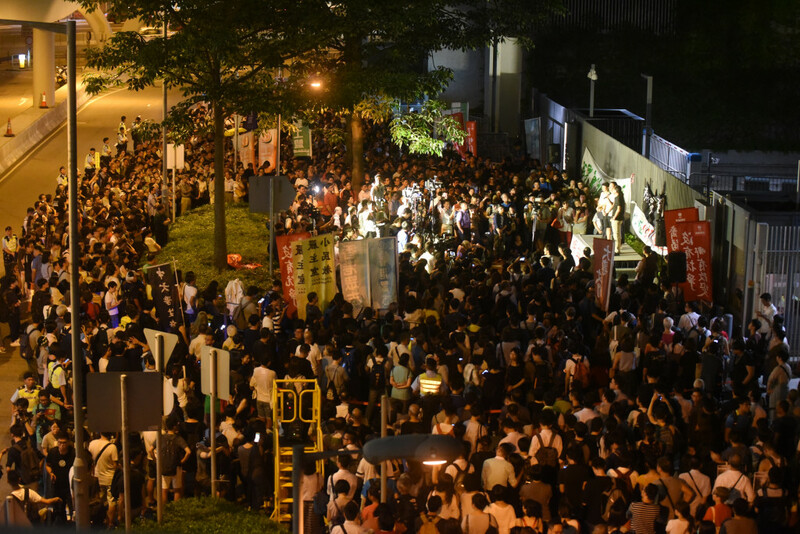 In the protest he was jailed for, he tried to stop protesters from breaking into the Legislative Council, but he was still incarcerated for participating in an unlawful assembly. “When there is a Raphael Wong in jail, can we have 100 other Raphael Wongs here?” Law asked the crowd. He said they did not need apologies from their supporters, but they will need continued support from the public to know their sacrifice and pain is worth it. 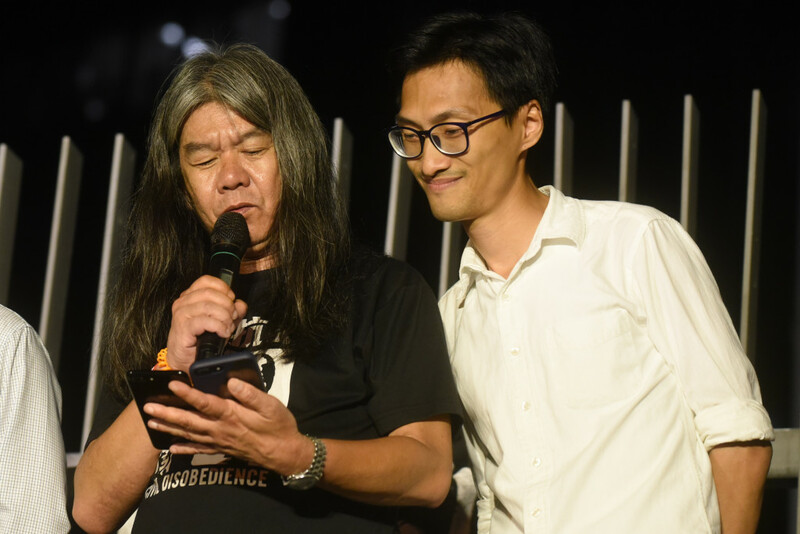 Former League of Social Democrats lawmaker “Long Hair” Leung Kwok-hung also read a letter from Raphael Wong’s father, so that Wong will be able to read what he said from newspapers. “It is my utmost honour of my life to have my son Ming, I hope the other 12 families will be proud of their children,” he wrote. He also urged Hong Kong judges to defend the separation of powers and be “judges with conscience” to protect the next generation.